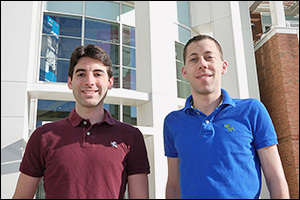 Fischell Department of Bioengineering graduate students and Diagnostic anSERS cofounders Eric Hoppmann (left) and Sean Virgile (right). Diagnostic anSERS, the Fischell Department of Bioengineering (BioE)-based startup company founded by graduate students Eric Hoppmann and Sean Virgile, both advised by BioE and Institute for Systems Research assistant professor Ian White, took 3rd in the final round of the Cupid's Cup, the national business competition held by the Dingman Center for Entrepreneurship at the University of Maryland’s Robert H. Smith School of Business. The company also won the competition's UMD Prize, awarded to the startup utilizing the most campus resources. The company received a total of $10,000, which they will use to scale up manufacturing for a product release this fall. Diagnostic anSERS produces inexpensive paper substrates for surface enhanced Raman spectroscopy (SERS), a molecular fingerprinting technique, using a modified inkjet printer and silver-laced ink. Diagnostic anSERS says its product will make advanced sensor technology available to more people, both in the lab and in the field, because it uses off-the-shelf technology and other readily available components. The printed sensors, which can be produced on-demand and on location by anyone who has had some basic instruction, are used to detect trace amounts of explosives, toxins and narcotics. "Our $4 piece of paper is able to perform better than our $105 competitor," says Virgile. The Alumni Association covered Diagnostic anSERS and its participation in the Cupid's Cup in a recent article titled "Bioengineering Students Create Inexpensive Contaminant Test Strip."